A short eBook of reflections on how the New Testament writers treat with the ancient Psalter! The Apostles quote the Psalms profusely throughout the New Testament. They were persuaded that the Psalter proved that Jesus was the Christ, the Messiah the Jews had long waited for. 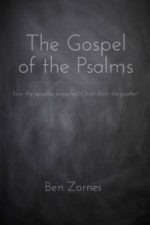 Their use of the Psalms are profoundly useful for us, as we study & interpret the Scriptures. The Psalms are full of glorious strains of expectant worship, as the Israelites waited for the promised Messiah. The Apostles saw in Christ the fulfillment & establishment of the reign of the Anointed King & His Kingdom. Their example teaches us how to see the Gospel of Christ, as it is proclaimed & revealed in the Psalms.